Lucinda Williams to play a very special and rare mostly acoustic set that you will not want to miss. Although always adept at painting landscapes of the soul, illuminating the spirit’s shadowy nooks and shimmering crannies – Lucinda has never captured the sun breaking through the clouds as purely as on her new Lost Highway release, Little Honey. I’m in a different phase of my life, so there are more happy moments on this album,” the singer-songwriter says of her ninth studio set. Williams wastes no time signaling that mood change, leading into Little Honey's opener, “Real Love” with a false start riff that's the six-string equivalent of a friendly wink – then sidling into the tune's hard-rocking vibe with a sensual slink that underscores the passion of finding exactly what that title indicates. The bluesy physicality of that tune is echoed in several of Little Honey's tracks, from the charmingly chugging “Honeybee” to the gorgeous melodies of “If Wishes Were Horses”. 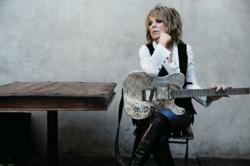 Catch Lucinda Williams plus Blake Mills on Friday, January 20th 2012. Doors open at 7:00pm, show starts at 8:00pm. Tickets for Lucinda Williams plus Blake Mills are $50. They are on sale now and can be purchased through the theatre website at http://www.uptowntheatrenapa.com, at Ticketmaster (http://www.ticketmaster.com) or at the theatre box office (please call 707.259.0123 ext. 6 for hours). To find out more, please visit http://www.uptowntheatrenapa.com. For more information contact Mindi Levine at the Uptown Theatre Napa 707-259-0123 extension #2.